I've had many a pinterest fail. Not necessarily fails because I couldn't do something (although I keep things pretty simple when it comes to what I pin so don't be too impressed) but because things just don't taste as good as they look on pinterest. This dessert isn't one of them. It is really good. Good enough that the hubs got into it one night after I went to bed. It's almost like a key lime pie, except it's denser. I preferred it frozen but a little thawed so I kept it in the freezer and took it out about thirty minutes before I wanted to eat some. I actually made a small batch this first time (why waste all those cashews if it wasn't going to be good!) but the next time I make it, I'll make a full batch. It's a good healthy dessert to have on hand to satisfy your sweet tooth. Also, I added more lime juice than the recipe calls for because I prefer a limier (is that a word?) taste, but of course do that according to your own taste buds. Enjoy! 1 cup almond meal (basically almond flower - it can be found at Trader Joe's for cheap enough that it's worth buying instead of making. If you don't have a trader Joe's, I'd probably make your own in a food processor because it's more expensive at Whole Foods, etc). Place almond meal and dates into a food processor and pulse till combined. Spoon crust into a pie pan and press into the pan. Set aside. Place nuts, honey, lime juice, lime zest and water into blender. Blend for a little bit and then add coconut oil. Continue to blend until everything is well blended and the batter is smooth. Adjust lime taste to your liking and add more or less juice or zest. Spoon lime filling on top of the crust. Place in freezer and let set for a few hours. Remove from freezer and keep in refrigerator until ready to enjoy (or keep in the freezer and remove thirty minutes before eating). Have you seen Gwyneth's new cookbook "It's all Good"? (Also, did you know that periods always go inside quotation marks but question marks only go inside the question mark if it was originally part of what is being put in quotation marks, i.e. a question?) It's an aptly named cookbook since it is, in fact, all good. Including this kale and quinoa breakfast dish (which I sometimes eat for dinner as well). 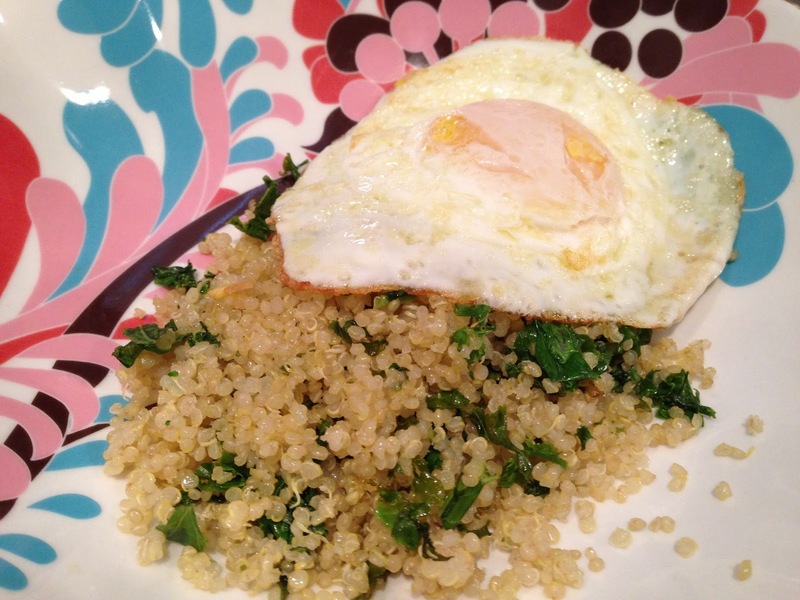 Turns out quinoa is basically a perfect grain. So perfect, in fact, that the hubs and I can eat it on our grain-free diet. It's gluten free and is a complete protein on its own. High in calcium, antioxidants and anti-inflammatory nutrients. One would think that such a highly nutritious food would not taste good. One would be wrong. Do yourself a favor and test me on that. Rinse the quinoa thoroughly and place it in a pot set over high heat with the water and a pinch of salt. Bring the quinoa to a boil, lower the heat, cover the pot, and cook until all the liquid is absorbed, about 12 to 15 minutes. Remove from heat. Heat the oil and garlic over medium heat in a small skillet until the garlic begins to soften, about 1 minute. Add the shredded kale and cook, stirring now and then, until the kale is wilted, 2 to 3 minutes. Add the quinoa and cook, stirring until warmed through, another 2 minutes. Season the mixture to taste with salt and pepper. Place the mixture in a shallow bowl or on a plate, top with the egg, and sprinkle with the scallions. Add a final grind of black pepper if you like. And then dig in and enjoy. I blame pinterest for the reason I was absent from the world of Snacks and Desserts for so long. It's so easy to pin recipes onto my "Delish (recipes to try)" board and then go back to that board over and over, both for the tried and true recipes and the new ones I plan to try. This recipe is one of the first pinterest recipes I tried. It is so so good. Pretty (impressive even) presentation and yet very easy. And delish. Next time you get a hankering for greasy mexican food, do yourself a favor and make this recipe instead. Fresh, healthy, and delicious so no food hangover the next day. The original recipe calls for rice but the hubs and I can't agree on the kind of rice we eat. I say we're a brown rice family. He doesn't like brown rice and insists we're a white rice family. I can't make myself eat white rice because it's refined, processed, generally unhealthy (sorry y'all!) so we compromised and we're pretty much a quinoa family. Don't worry, though, quinoa and rice are pretty much interchangeable without sacrificing any flavor, and this recipe is no exception. Whether you go with brown rice or quinoa, you can't go wrong (just don't go with white rice!). Start your brown rice (or quinoa) in a pot on the stove. Next, add ground beef and chopped onion to a large saute pan. Add garlic powder and salt and pepper. When the meat is browned, add 4 cups of salsa. Bring the salsa to a boil and then reduce the heat to a simmer. Cover and simmer for about 20 minutes. 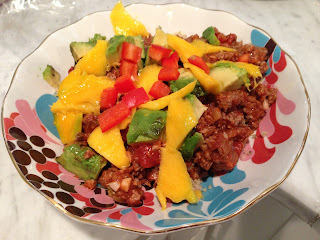 In the meantime, chop the cilantro, pepper, avocado, and mango. 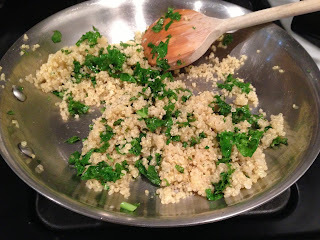 When the rice (or quinoa) is done, stir in almost all of the fresh cilantro, leaving just enough to garnish each dish. 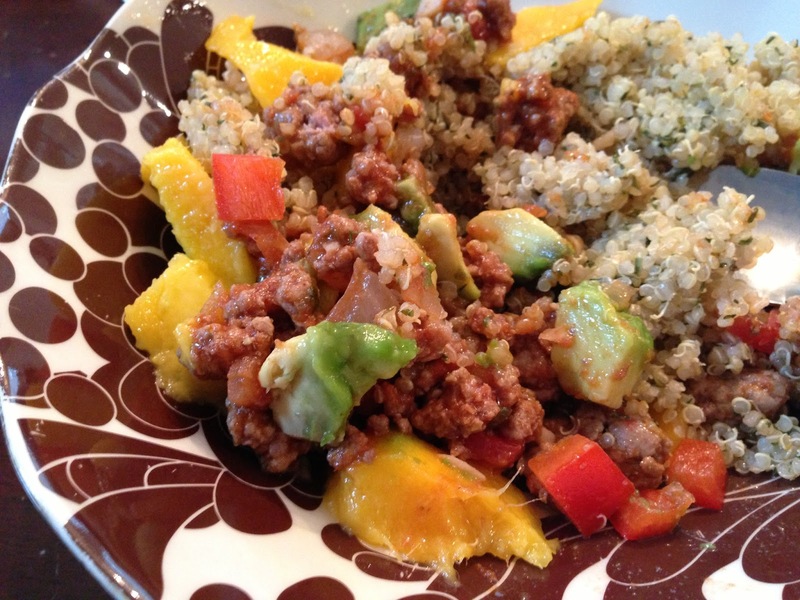 Find a small bowl or ramekin and put the rice (or quinoa) in there, pressing it down with the back of a spoon. Turn the bow over to empty the rice (or quinoa) on a plate. It should slide out pretty easily and maintain the form of the bowl you used. Top with meat and other toppings. The hubs and I are on a new restricted diet to help treat his candida (too much yeast in his body) and his ulcerative colitis. Bless his heart. I actually don't mind as it's a good excuse for me to detox and get to a good baseline again. As you might know, it takes time and effort to stay committed to a non-processed diet, and with the busyness of spring and summer (not to mention the perfect sitting outside weather that spring brings) processed foods crept back into my diet more than I would have liked. Never fear, though - the hubs' candida and UC have us back on the right track! Have I said bless his heart yet, because bless it indeed. What exactly is restricted on this diet, you ask? Well, a lot. No grains (except quinoa, flax seed, and millet), no fruit except berries, no soy, no cow's dairy, no sugar (even natural sugar like honey) etc. What can we eat? Meat (good thing - I don't think I could convince the hubs to go vegetarian), eggs, vegetables, berries, raw nuts. I mean, that's not all we can eat, but the point is that it's pretty restricted. The moral of my story? I love recipes like that are all-around good for everyone. Even people who are on really restricted diets. Do yourself a favor and if you don't have a garden, go to a farmers market and get local squash and zucchini for this recipe. Amahzing. Heat oil in same skillet over medium heat. Add garlic and red pepper flakes and cook, stirring often, until fragrant but not browned, about 2 minutes. 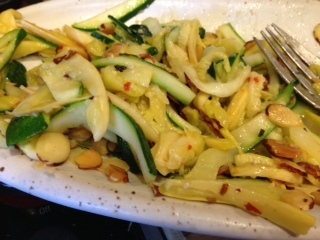 Add squash and cook, tossing occasionally, until crisp-tender, about 5 minutes. Fold in Parmesan (or goat's cheese) and season with salt and pepper. Fold in almonds. Birthday monster. Noun. A person who celebrates his or her birthday to the fullest extent possible, using every possible excuse to create a celebration of the day. I actually hadn't ever heard that description for someone like me until this past Friday (which, coincidentally, was my birthday) when I had a quick email exchange with a work friend that went something like this. The email exchange was followed by a trip to Starbucks (no guilt for getting a latte on my birthday after all) where I proceeded to tell all the employees it was my birthday. On the way back to the office he commented that I was "one of those birthday monsters." (See above definition). I am most definitely a birthday monster, which I explained here. And this year was no exception, even if the weather did rain for 48 hours straight. On Sunday we went to my parents' house for a family birthday lunch and my mother made the best shrimp and grits ever and not one but TWO desserts. Naturally, since I was the birthday girl, I partook in a little bit of both. So today I'm cleansing (more on that later) but oh my word was it ever worth it. But do yourself a favor and make a batch pronto. You won't regret it. The primary sweetening agent is dates so it's like a chocolate larabar, which means it's virtually guilt free. And the best part is that they're super easy so you don't have to wait for your birthday for an excuse to labor over them. Whip them right up and be on your merry way, doing your best not to eat the whole pan in one sitting. Place pecans in your food processor and process until they become small and crumbly. Add dates and process again until the mixture sticks together and the dates are well processed. Add the remaining ingredients and process again until the mixture turns a dark chocolatey brown. Stop processing before it gets too buttery. (There should still be air between the small bits so that you will be able to press them down into your brownie pan.) Dump the mixture into a brownie dish or small cake pan and press down firmly using your clean hands. Y'all. 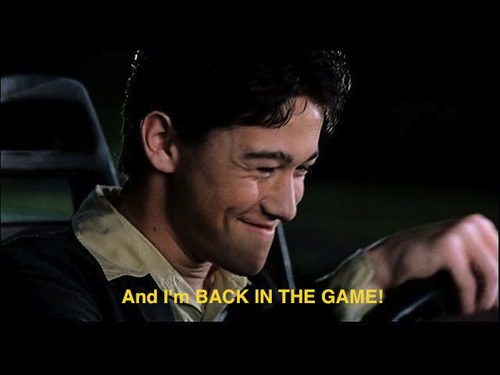 I'm back. I know, I know. It's been OVER A YEAR. Too long. What has kept me so busy? Well, I got a new job (ok, ok, not so new anymore since I've been here for over a year) that I LOVE. Between working full time and teaching yoga and taking care of my two precious angels of dogs and helping with my local farmers market and the missions committee at my church, well, I'm a bit busy. But at long last...I'm back in the game. Please tell me y'all can name (and love) that movie! So to celebrate my return I thought I'd start with a little comfort food. Comfort food is the best. One of my favorite comfort foods is breakfast for supper. Brupper if you will. But let's be honest, there are only so many ways to eat eggs and bacon before you get burned out. Enter this recipe. It's a twist on breakfast in that it's polenta (side bar: my husband says polenta is the rich man's grits and I think he might be right because they taste the same to me. Except I don't think cornmeal is any more expensive than grits.) and brussels sprouts. So it's a good way to add vegetables to your brupper, which I've always struggled with. Drizzle Brussels sprouts with olive oil garlic. Cook at 350 for 20 mins. 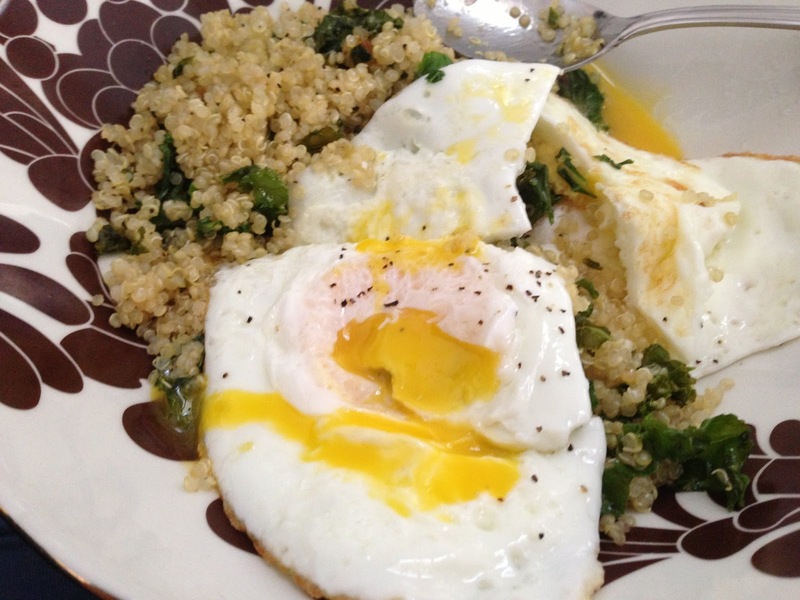 Serve cooked polenta in a bowl and top with one egg. Crumble one slice of bacon on top. Fudgesicles are the perfect combination of chocolate and ice cream, right? What's not to love? Um, sugar. I used to eat fudgesicles every night when I was on the many diets I tried. They were the perfect guilt-free dessert. Or so I thought. I'm not saying you should feel guilty if you occasionally splurge on something with sugar on it. But thanks to this recipe, fudgesicles don't have to be one of them. I love this recipe. I love chocolate. I love ice cream. I almost always eat a dessert of some sort at night. And now fudgesicles are in the rotation. Guilt free fudgesicles. Lest you think guilt-free = gross, I offer the previous photograph of the hubs into evidence. He likes these fudgesicles. Do you? *With school starting back up, these fudgesicles are the perfect after-school snack. And I won't even tell your children it was my idea. You're welcome. optional: you could add a spoonful of peanut butter. Yum. Or strawberries. Or dark chocolate chips. The options are endless. Combine all items in a blender and blend until smooth. Pour into popsicle molds and freeze. Easy peasy.